and was taken to Windham Hospital for observation. The most enduring image from Saturday morning's UConn practice was not the back to back 20-yard hookups from Chandler Whitmer to Geremy Davis, freshman fullback Matt Walsh's four touchdowns in short-yardage 11 on 11 drills or Obi Melifonwu's interception which was returned for a score. 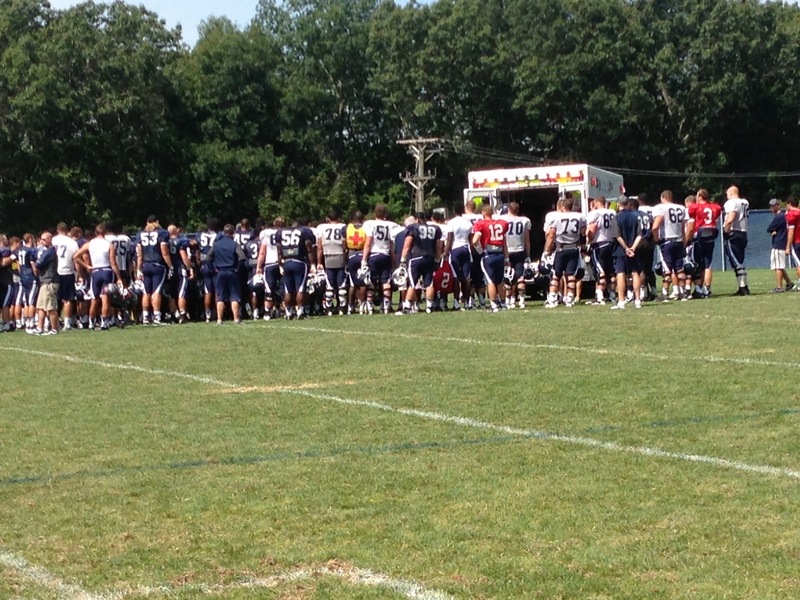 Instead, it was Sean McQuillan's teammates gathering near the ambulance that the sophomore tight end needed to be loaded into after a collision with Taylor Mack late in practice. Whitmer swung out a pass to McQuillan and the ball arrived just before Mack did. Mack delivered a big hit which sent McQuillan sprawling backyards. After crashing to the ground, McQuillan rolled over and was in obvious distress. After being examined for about 15 minutes, a backboard was brought out to stabilize McQuillan and he was taken to Windham Hospital for observation. 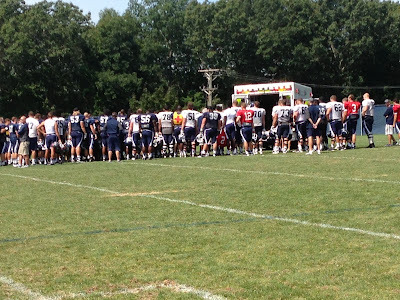 "It puts a damper on the day," UConn coach Paul Pasqualoni said following practice. "Fortunately he was wiggling everything so we are optimistic that he will be OK."
Pasqualoni said McQuillan, who is projected to be the starting tight end for the Huskies, was communicating when he was being tended to. "He is in great care, they know exactly what they are doing," Pasqualoni said. "You just don’t like to see stuff like that." McQuillan was taken to Windham Hospital for observation but was treated and released. CT scan on his head and neck were normal. He is back on campus and being treated for a concussion. Shortly after the collision Pasqualoni came over to the sideline and told Mack that the hit was "unnecessary." Following practice Pasqualoni was not about to place blame on Mack for causing the injury to McQuillan. "The corner made a break on the thrown ball and they collided," Pasqualoni said. "It just happens in football and it is part of the game unfortunately. The way it happened, it was a bang-bang play. When you are playing that type of coverage and that player has that zone of the field so he is playing the ball more than the guy so often times you don’t see the guy, you are going for the ball and it has always been part of it." Mack was clearly shaken emotionally after seeing McQuillan taken from the field in the ambulance. "I started praying, that is about the only thing I can say," Mack said. "God blesses you every day to come out and play the sport you love and you never take it for granted. I am praying for Sean, we are all praying for him. I am going into the locker room and say a prayer for him after I step off this field. "It is just a football play. You can’t take it for granted, walk out on the field, smell the grass and thank God that you can play the game." Starting safety Andrew Adams was also injured during practice. Adams was tangled up with Davis in a receiver/defensive back blocking drill. Davis was able to keep Adams from breaking through Davis' block but the two were still engaged after the drill ended before Adams fell hard to the ground. He immediately was tended to by the medical staff and did not return to practice.